January 13, 2010 – Let’s take a look at the top players from Louisiana who are playing in bowl games. Here are some updates on how they are doing. DT Wes Sauao (6-3 292), a Junior, from Leesville High School, was the first DT off the bench for Central Florida when they played Rutgers and lost in the St. Petersburg (FLA) Bowl. Sauao played nose guard at Leesville High School, and was super quick, but he wasn’t highly recruited. SS Reggie Weams (6-0 191) backed up a SR all year but got a ton of plays as a nickel back and will start in 2010. Weams prepped at Redemptorist High School. He is a tough kid that loves to hit, and he has a NFL future. In the New Orleans Bowl, Southern Miss had a large number of Louisiana players on the two deep, and many were starters. OG Ryan Hebert (6-5 297), a senior, has a chance to get drafted depending on how he does in the combine. Ryan had great feet in High School at H.L. Bourgeois in Houma, LA, and he can really move. He was offered a Scholarship by South Carolina, but the staff, at the time, lead by Lou Holtz, did not return. Dave Roberts, Head Coach at Northeast College in Monroe (now ULM of Monroe) was the coach recruiting Hebert. WR Gerald Baptiste (6-0, 185) who runs a 4.5/ forty, walked on to the Southern Miss program, and started two years , and was productive this year with 38 catches for 558 yards and 5 td’s. Baptiste played at Edna Karr on the Westbank of New Orleans. Another former Edna Karr football player named LB Korey Williams 6-2 233 a (JR) was one of the leading tacklers for the team at Southern MISS. The starting Kicker for Southern MISS was former Holy Cross player Danny Hrapman 5-9 160, who transferred from IAA Southeastern in Hammond, LA. (Center), Cameron Zipp, 6-1 297 (JR) started the whole year for Southern Miss, and played for Fontainbleau High School. DE Deddrick Jones 6-3 245, (SO) has a NFL Future , and is from Bastrop High School, but came from a school which is no longer around called Delta High School. Jones can run a 4.7 forty, and will one day be in the NFL as a 255 or 260 DE. DE David Boyce 6-6 248 (JR) was a key back up at DE for team all year long, and should start in 2010, David prepped at ST Paul’s High School in Covington. WR Johdrick Morris 6-3 210 (JR), was a starter in place of star WR DeAndre Brown 6-6 235, who was hurt for a few games this year, Morris has a chance to start his SR season, and has a NFL body, can run a 4.6 forty, Morris will be a 5th year SR in 2010. Morris played at Central High School. In the Music City Bowl, which had Kentucky against Clemson last night, two Louisiana natives played and made a impact, RB Moncell Allen 5-7 225, who is Redshirt (JR), got in the game late and had some nice runs, Moncell has a chance to be either first or second team next year for Kentucky in the SEC, Allen prepped at Holy Cross High School in New Orleans. LB Jacob Dufrene 6-1 220 (JR) , starts for Kentucky, and had some key tackles against Clemson, one which he tackled Star RB and Future first round pick RB C J Spiller Clemson behind the line for a loss, which is hard to do. 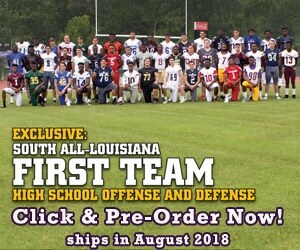 Dufrene played high school football at John Curtis in River Ridge, LA. In the Independence Bowl , Georgia goes against Texas A&M, who has two key players starting for them from Louisiana, Georgia doesn’t have any 2 deep players from Louisiana on the roster. LB Jonathan Stewart 6-4 227 pounds, a True Freshman will start tonight, and has made 7 starts during the season, Stewart played for Byrd High School in Shreveport. Stewart has a great frame, and can run a 4.6 forty, Stewart is # 11 on defense, Jonathan has a chance to be a high draft pick one day , before he’s done at A&M. OG Patrick Lewis 6-2 312, (FR), True Freshman, is starting the game, and has made several starts as a True Freshman this year. Patrick played at East ST John, High School in Laplace, and has quick feet for a big guy, he’s not tall, but he’s so athletic and quick, it makes up for that. Watch Lewis tonight, and you will see a future all conference player for the ages, and maybe an ALL American one day at OG.